We are getting ready to begin a bathroom make-over. We have one bathroom in our entire house so it needs to be quite functional as well as nice to look at! I'm leaning toward a moody paint color. Maybe navy or a dark gray. I love the wall color in this bathroom from Cape27blog. Isn't that vanity so creative?! This bathroom from Centsational Girl is gorgeous! I love the glamorous touches like that awesome mirror! The beadboard wallpaper and woven shade on the window are great features too. 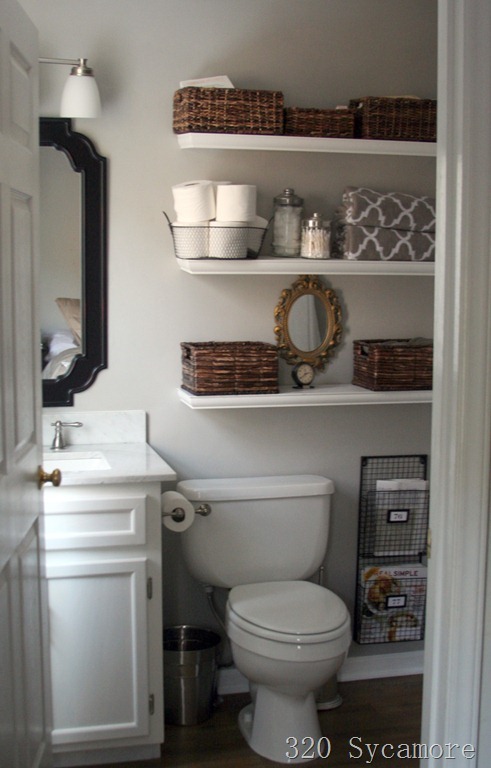 I really like the look of open shelving in a bathroom. I think it helps make a small space feel less cramped and adds lots of storage and function without using bulky cabinets. It's decorative as well. This bathroom from 320 Sycamore shows just how much beauty and function you can still have in a smaller space. So those are a few of the spaces that inspire me for our bathroom make-over. Who knows where it will end up, but I will be sure to post our progress along the way.